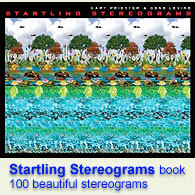 ASCII Stereogram : Stereogram Images, Games, Video and Software. All Free! Width and Height - dimensions of the stereogram in characters. 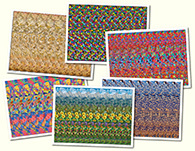 Parallax - size of repetitive pattern (texture). After you set these values press [Reset] button. Then continue to Texture and Depth Map entering. You can use any characters for the Texture, but avoid using of the same characters in the same line. For the Depth Map use numbers which represent level of depth, 1 to 9. Empty space is equal to level 0. 6. It s awesome! I made my first TXT stereogram :). 7. can anyone give me some tips? nothing i make comes out the way i wanted it to. 9. I do NOT get this!!!!!! 11. Very nice... Though how to make the depths correctly? Only nine(Maybe ten) come out as I thought. 16. Please help I have no clue what I m doing.